This is what the sky should look like now, but instead it is a weird color that is somewhere in between light brown and blue. August of 2003 is not normal for Paris. June and July were a bit warmer than usual, but at least the sky was blue. 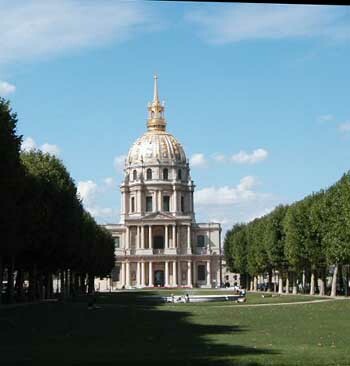 The above photo of Invalides was taken a month ago. 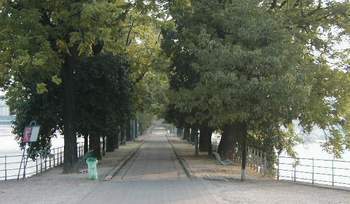 Each morning now, I take an hour long walk along the Allée aux Cygnes. Then I buy the day's newspapers in French and English. In these photos, above and below, you can get a sense of what the air pollution looks like. 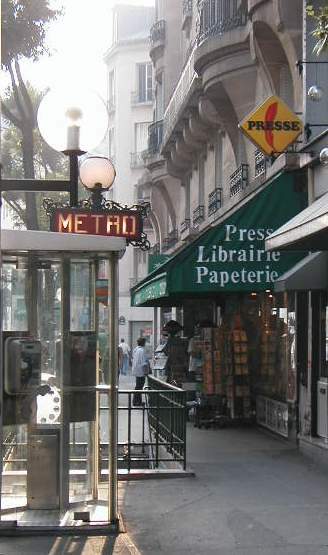 Here's where I buy the morning papers on Avenue Emile Zola, just a block away from the apartment. On Sundays, I have to go up to the open market to get the paper -- another couple blocks. You ask an interesting question; one that I have never adequately addressed in the Paris Journals. Why Paris instead of the more typical North Carolina mountains (or Maine, etc.)? I told Tom about your question and he said, "Well, I grew up near the North Carolina mountains and if you ask me, there is no comparison." It all started seven years ago. We'd been itching to travel to Europe, and I was green with envy every time our friends Murray and Ellen would come back from one of their exotic summer trips (Greece, Italy, Spain, Ireland) and invite us over to see all their slides and to hear about their adventures. Tom asked to be put in charge of the Bath program in the summer of 1998. (Tom was, until last month when he retired, a professor of English at Ohio State University.) That's is a 6-week study abroad program for OSU students, mostly English majors, in Bath, England. Typically, the professor and spouse get to go. They receive one round trip ticket and free lodgings, and the stint counts as a full "on-duty" quarter for the professor. It was a great deal; we had a good time, and so did the students. Southwestern England is lovely. It was a short quarter for us -- a full quarter at OSU is 10 weeks long. So we had time after the 6-week Bath program; we could spend almost six more weeks in Europe before Tom had to be back to teach in the Fall. I was flexible; I took a leave from my regular job at Battelle and had started freelancing as a web site developer -- a job that I can do from almost anywhere on the planet. No job was pulling me back to the U.S. I had heaps of frequent flyer miles from business trips for Battelle. Another round trip ticket, no problem. We decided on Paris after Bath in part because of Sanibel canoeing experience the preceding winter. We were canoeing with new friends, Dean and Alvi, who had just returned from a sabbatical. Part of that time they'd spent in Paris, in an apartment that belongs to Roy, a longtime friend of Dean's. As we canoed along the Sanibel River, Dean and Alvi told us all about the apartment and their experience in Paris. We were enthralled. Tom and Dean were so distracted that they capsized their canoe and lost their bifocals. We knew a little French, and we knew we'd have time to spend in Europe after the Bath program. Dean said the apartment is normally booked up every summer, but hey, it was worth checking with Roy to see if it was available in August. Roy teaches at a university in Paris and goes to the U.S. for the summer. He inherited a vacation home in the Hudson River Valley where he's spent all of his summers. But he is very protective of the apartment in Paris. It has, literally, 10,000 books. So, only certain kinds of people are allowed to rent it. We qualified. Roy's August renter had backed out. The place was available. When the Bath program ended in mid-August, we flew from London to Paris. We had two weeks in the apartment in Paris, and we loved it. We're city people. Sanibel is a tiny, rural village. We need our dose of city life. Paris is a grand city in which to live, at least for part of the year. Winter would probably be dreary there. After the two weeks in Paris, we had another three weeks or so to spend in France. We rented a minivan and travelled through the country, making a huge circle that included the chateaus of the Loire valley, the Ile de Re, La Rochelle, the Dordogne, Carcasonne, the Riviera, the French Alps, and Reims. Then back to Paris. Back to London. Then home. We were hooked. We asked Roy if by any chance the apartment would be available the next summer. It was. We were booked for July and August. And the next summer as well. Then in 2001 we were fortunate to have it for the entire summer. Same thing last year and this year. Roy loves having just one couple for the entire summer, instead of three different tenants for a month at a time each. And we fix things in the apartment for Roy. That means that we deal with hardware stores, etc., giving us even more of a sense of really living there. We work a little while we are there. We read a lot, and we write. I manage my web sites from Paris, but I'm slowly getting out of that business because textbooks are more lucrative. Although Tom retired from OSU, he's still writing textbooks, and I'm helping. We now feel like we are a part of the neighborhood near the apartment. People recognize us and greet us on the street sometimes. We wander about the city with ease now. Paris no longer seems huge and unknowable. The city is beautiful, in a very old and urban way. The food is fantastic. So is the wine. With the plethora of choices, places to go, things to do, every evening -- we feel blessed. And another thing: living in a foreign country for a while gives one a much better sense of what it means to be an American. Really. Everyone should try it, but I think only 14 percent of Americans hold passports. The mountains of North Carolina are nice but we might be bored there.